Okay. Whew. I'm back from my overwhelming conference (click here for a picture of the dress I spoke in) and ready to think about dresses again. Like this one, from eBay seller ElegantlyDelightful. Oh, how I wish it were in a larger size … this one is a B32. Surplice top, midriff band, full or slim skirt … what's not to love? And you could easily put nice pockets in those front skirt seams. I missed blogging against sexism! Erin, you look like you’re on the half-time set for the Superbowl. Are you ready to belt out “America the Beautiful”? I know, I know! (about the flag)I was trying to make the point that a lot of people use “the dictionary” to stand for “the English language” the way we use “the flag” to stand for “The United States” — using a part of something, or a symbol of something, to stand for ALL of something. Ergo, BIG FLAG PICTURE. That pattern is so gorgeous and I love the dress you are wearing. You look great….I love the color combination! 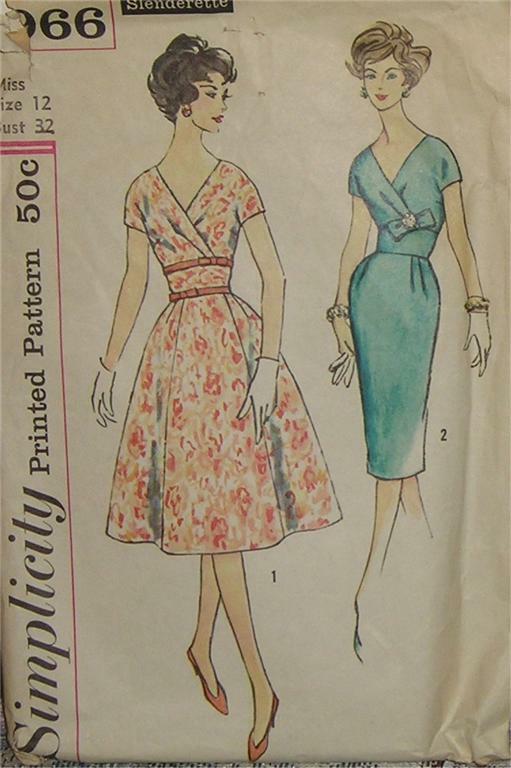 this is a slightly more modern pattern but is similar to the one you posted http://www.mccallpattern.com/item/M4826.htm?tab=dresses&page=2 and this one you can buy in which ever size you like! If you click, “other photos tagged erin” you can see the whole dress. I like it. AND, those, Erin, must be pockets? I also like the red piping, if that is indeed the term. HOLY FLAG! YOU DO THE COUNTRY PROUD IN YOUR DURO. WHOOP WHOOP! Lovely dress, Erin!And I really love the pattern posted today too. I didn’t know that was called a surplice bodice, but I’ve been looking for one (pattern or ready to wear) because I’ve always loved it. Now I know what to call it! A lovely dress today and the one you are wearing in your photo. I have psoted several tiems in the past week and none got through. A glitch in my system? OK – now it works(and I said so many insightful things before…lost forever). One thing I did want to repeat — thanks to Erin and her inspiring blog, I have made three dresses and four skirts so far. My pattern collection is growing and so is my fabric stockpile. Thanks again for all the tips and inspiration. I’m sorry (really! ), but that duro just looks too much like a robe (as in, PJ’s or wear after a bath). Quite possibly because my father used to have one with nearly the exact same color scheme, and the same contrast bands, and the tie in the front–and even the piping, too, I think. I would never ever be able to wear it without feeling like I was wearing my pajamas. Getting up and speaking in front of people is scary enough, but doing it in PJ’s definitely counts as “bad dream” for me. You didn’t look the least bit disturbed, though, so I suppose it doesn’t have any bathrobe connotations for you, which is all that matters.You are much more photogenic than I will ever be. Thanks for posting the picture of yourself – very cute dress.I absolutely love the dress pattern you included in today’s post – I can see stitching it in both styles – normally, I would go for the slimmer skirt, but I also like the fuller skirt. Very nice. Wow! I think my mom made that dress in the view 1 version in the mid 50’s! If it wasn’t that one exactly, it was one very like it. I remember it very well because the cotton fabric had a pattern of purple and yellow pansies on a white background. The pansies were about the size of a nickle, I think. She used purple cording in the bodice seams – it was very cute. She must have liked it too, because when my sisters and I cleared out her house, we found some scraps of the fabric in a trunk along with some other things. Unfortunently, it had gotton stained so we threw it out. I kind of regret that now. That is such a popular pattern just now; I like what you did with it. Seems like everyone needs to add the modesty panel at the neckline…You look so cool and collected: Brava!I (hanging head in embarrassment) knew nothing about TED and I live just across the Monterey Bay in Santa Cruz! What a marvelous event. I spent many minutes at the TED site; tried to find out just what you spoke about, but failed. Needless to say, I am very intrigued! My 32-yr.-old niece just moved in with me: I bet when I ask her about it she will say, “oh, yeah, that’s been going on a long time. What’s her name?” Meaning you, Erin. I keep showing her vintage patterns I like and she likes many of them, too, but this will be a new wrinkle.I love your blog! That is a wonderful shot of you, Erin! Full of life and animation (and an excellent dress). Although my usual complaint: it doesn’t show how pretty you are.